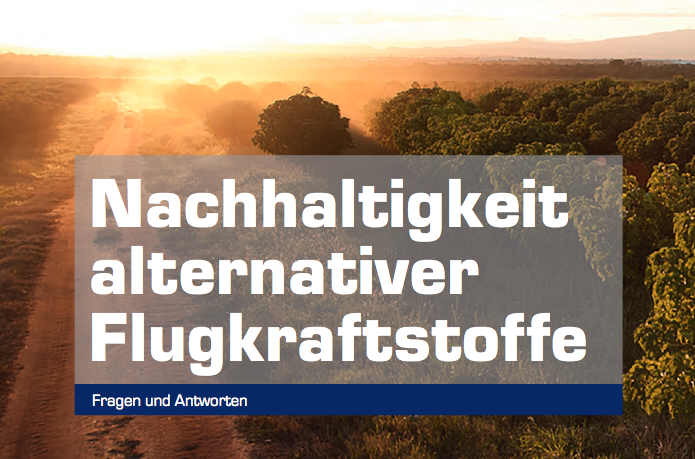 Fuels of the Future: aireg to showcase market-ready alternative aviation fuels technologies - Aviation Initiative for Renewable Energy in Germany e.V. After years of market preparation more and more airlines are using alternative aviation fuels. This year Lufthansa Group will conduct 5,000 flights from Oslo with bio-kerosene. Unfortunately, Germany still lacks biorefineries and appropriate framework conditions. As part of the 12th International Congress “Fuels of the Future” aireg demonstrates how the necessary infrastructure can be created in order to strengthen the sustainability of aviation. aireg hosts a panel on bio-kerosene on the second day of the “Fuels of the Future” in Berlin’s new convention center CityCube. Honeywell UOP, OMV and TOTAL present their innovative technology options, while Lufthansa shows how alternative aviation fuels can positively influence the fuel purchase of the airline in general. On the occasion of the conference aireg releases its new brochure “Sustainability of Alternative Aviation Fuels”. The initiative clarifies its position on current issues like feedstock competition, social impact and development opportunities of bioenergy production. BAUER Resources GmbH becomes member of aireg e.V.